Photographs by anthony tieuli / food styling by Sheila jarnes/Ennis inc.
Blue cheese and bacon burger. 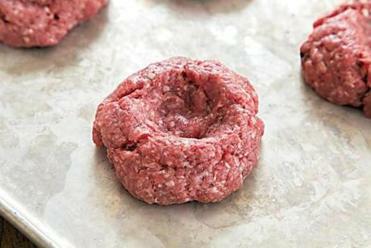 Flat patties: A small depression (roughly 1 inch in diameter and ½ inch deep) in the tops of the patties gives them a greater chance of cooking up flat instead of bulging at the center. Confessions of a ketchup junkie: I’ve been known to eat burgers (and fries) strictly as vehicles for the blessed red sauce. On occasion, though, it’s the burger that I really want, and while a beautifully grilled patty easily stands on its own, there are times when only a tricked-out version will do. Here’s one with the royal treatment — garlic and thyme mixed into the meat, classic additions like cheese and bacon, and a big dollop of homemade, bourbon-laced grilled onion relish on top. If you are not a blue cheese enthusiast, substitute thin slices of any good-quality cheese that appeals to you. Slices of red, ripe local tomato are nice, too. In a medium skillet over medium heat, fry half the bacon until rendered and browned, turning as necessary, about 8 minutes. Remove to paper towels to drain, and repeat with the remaining bacon. Pour off all but 1½ tablespoons of fat from the skillet. Adjust the heat under the skillet to medium-low, add the garlic and thyme, and cook, stirring, until fragrant, about 45 seconds. In a large bowl, break up the meat into rough chunks. Add the garlic mixture, 2 teaspoons salt, and 1 teaspoon pepper, and mix lightly with your hands to thoroughly distribute the seasonings. Divide the mixture into 6 equal portions and, with a light hand, gently form into patties roughly 4 inches in diameter and 1 inch thick. Press a divot into the top of each patty. Refrigerate, covered, until ready to grill. Prepare a medium-hot fire in a charcoal grill or preheat a gas grill on high for 15 minutes. (If using a gas grill, adjust burners to medium-high and keep the cover shut while grilling.) Grill the burgers without moving them until grill-marked on the bottom, about 3½ minutes. Flip the burgers and grill for about 2 minutes longer. 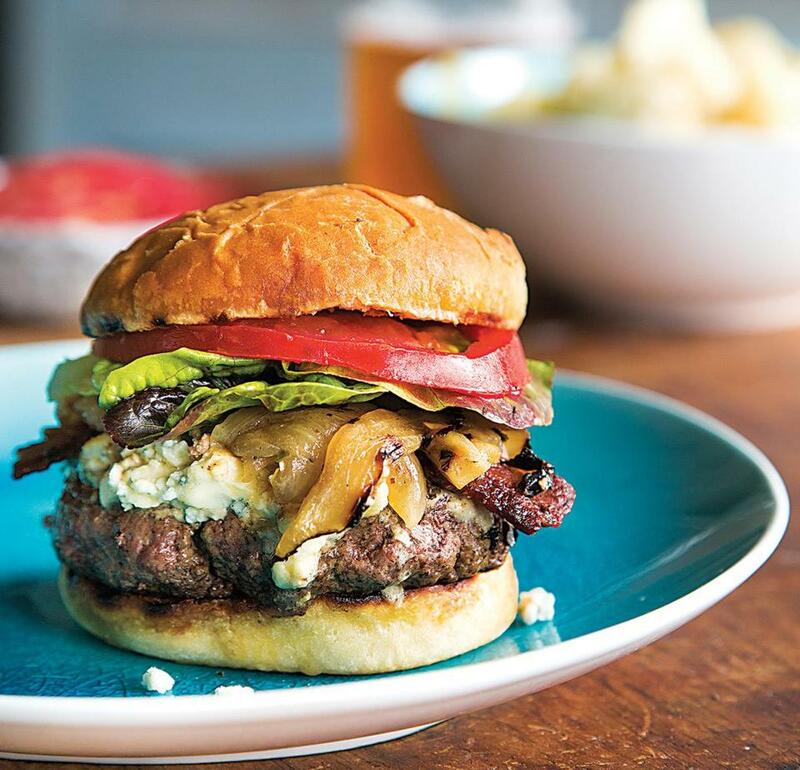 Top each with a portion of the blue cheese and continue grilling until the meat is medium-rare (the center of the burgers should register 130 degrees on an instant-read thermometer), about 2 minutes longer, or medium (135 to 140 degrees), about 3½ minutes longer. Place burger on half the muffin, top with 2 slices bacon, a dollop of relish, garnishes, and the other half of the muffin, and serve. Skewering the onions makes them easier to manage on the grill. If you’d rather avoid alcohol, substitute orange juice for the bourbon. Prepare a medium-hot fire in a charcoal grill or preheat a gas grill on high for 15 minutes. (If using a gas grill, adjust burners to medium-high and keep the cover shut while grilling.) Skewer the onion slices if you'd like, brush them with 2 tablespoons oil, and sprinkle with salt and pepper to taste. Grill until just tender, browned, and grill-marked, 12 to 20 minutes, turning once after about 6 minutes and as necessary thereafter. Slide the onions off the skewers if using and chop them (you should have about 2 cups). In a medium saucepan over medium heat, mix the remaining oil, garlic, and thyme and cook, stirring, until fragrant and just beginning to sizzle, about 1 minute. Add the vinegar and honey and bring to a simmer, stirring. Add the onions, ½ teaspoon each salt and pepper, and the bourbon and cook, stirring occasionally, for about 3 minutes. Set aside off heat to cool to room temperature. Add the lemon juice and stir to mix. Taste and adjust seasoning with salt, pepper, and lemon juice if necessary. Add the parsley, stir to mix, and serve at room temperature. For a great side dish to go with burgers, try this slaw of thinly sliced kale in a honey and orange-laced dressing. In a large salad bowl, whisk the vinegar, honey, orange zest, shallot, ¾ teaspoon salt, and pepper to taste to dissolve the honey and salt. Vigorously whisk in the oil. Taste and adjust the seasoning with salt and pepper if necessary. Cut the kale leaves into thin strips (stack a couple of leaves flat, roll them lengthwise into a tight cylinder, and cut across the cylinder to produce long, thin ribbons). Add the kale to the salad bowl along with the scallions, most of the radishes, ¾ teaspoon salt, and pepper to taste; toss thoroughly until all the kale is coated with dressing. Taste and adjust the seasoning with salt and pepper if necessary. Sprinkle with the remaining radishes and serve.